I could tell you that last night 3 people left their wheelchairs. I could tell you about a woman who no longer needs an oxygen tank. 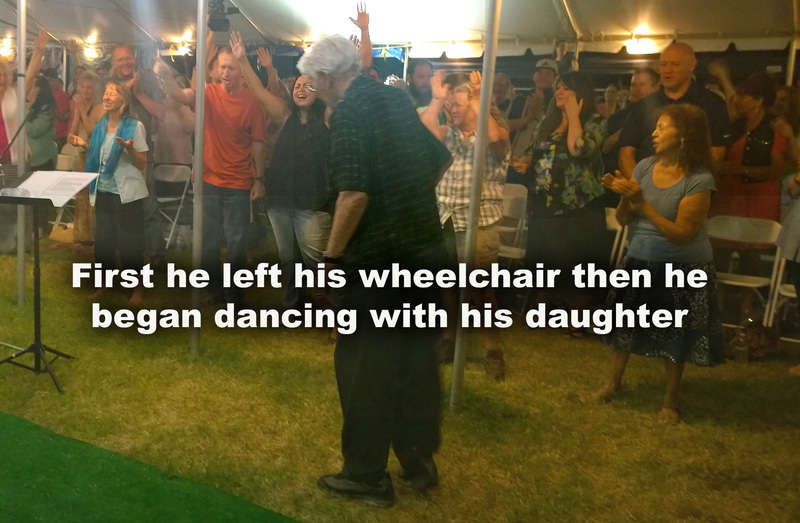 I could tell you about the man who left his wheelchair and then began dancing with his daughter…there was not a dry eye in the tent…I could go even further and describe a moment when a blanket of power covered the crowd. You could hear shouts of victory that pain and sickness were evicted from bodies everywhere. Those are the kinds of things we want to hear, but that would not be the real story of Living Proof Yuba City. Living Proof Yuba City is a story that all of America needs to hear. And all of America needs to understand the real story. I saw the real story when I looked out at the audience and saw a women holding her sobbing teenage granddaughter. This young girl embodied the emotional war of our American youth who navigate despair. The young girl saw miracles, she felt power, she was overtaken by hope and she gave herself to Christ. For her, life was no longer a cruel accident; the universe no longer a cold, abandoned expanse. She had found her FATHER, a father who would care for her and lead her. This is not the story of a good meeting… but of the Church rising up and escaping the safe zones of church buildings. Love took on muscle and good intentions became action. People of every culture and age group are being saved. After 48 years of preaching I am still dumbfounded by the power of Jesus to undo tragedy and ignite miracles. However, there is a special vengeance to the way the Holy Spirit is moving here in Yuba City. Something has welled up in the heart of God for a community caught in the cross fire of economic misfortune, drug addiction, and breathtaking neglect. Indeed, we have seen the very same thing that Luke mentioned. Every night we hear the entire crowd rejoicing over the things being done by Him! But the real story is even bigger than this. God is not content to have a good meeting; He is shifting the atmosphere of the Christians and thereby shifting the atmosphere of the community. The Spirit of God does not stay in the tent but hovers tenderly over the whole community. Here is an example: A family is in the park and they can hear us singing. They stop their activity and move cautiously toward the tent. They begin to cry. They are afraid to walk into the tent but they also cannot walk away. 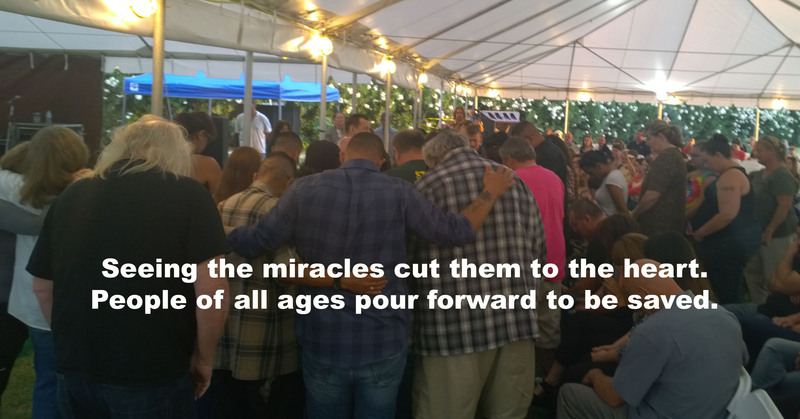 Moments later they find themselves at the front repeating a prayer that will make them a new family and put their names in the Book of Life. There is a dangerous element to Living Proof Yuba City. The people have an insatiable hunger for more. They don’t miss a meeting. They stand inside the tent in temperatures of 106 degrees. Nothing can keep them away and nothing will stop their pressing into God. Sometimes I know a meeting needs to be extended by direct revelation. In this case, it is a matter of utter necessity. By acclamation, this must go on—the people will have it no other way. This is the best situation of all– when neither man nor devil knows how big a move of God is going to get. Stay tuned.